We are currently putting the finishing touches on our 2015 CMO Innovation Trends study. (Thanks a million to all who contributed.) I thought you’d like a sneak peek into what we learned. 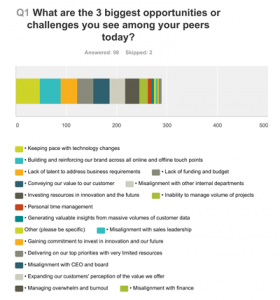 Over 100 senior marketing leaders responded, representing a wide range of industries. They include academic, software, hospitality, manufacturing, trade associations, real estate, cyber-security, media, banking, pharma, legal, consulting, insurance, nonprofit, and health care. CMOs from Australia, India, Israel, Switzerland, Africa, and England also participated. 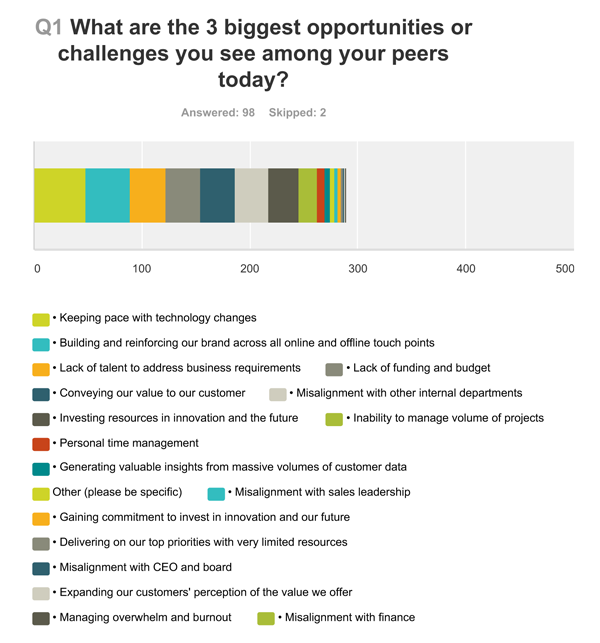 Respondents felt their peers’ biggest challenge is keeping pace with technology. However, when asked the most pressing challenge they personally face, “lack of funding and budget” ranked the highest. Nearly 80% were willing to invest funds to address their biggest challenges, compared with 50% in 2014. One of the areas they will be investing more in 2015-2016 is their content strategy. We will be digging deeper to explore how they intend to invest funds, especially when “lack of funding and budget” persists in their top 3 challenges list. Respondents continue to favor a personal touch when it comes to receiving and applying advice and insights. CMOs prefer smaller, private, face-to-face peer meetings as well as breakfast seminars. Much like our last two annual study results, webinars and e-newsletters remain popular learning mediums when time and money are tight. 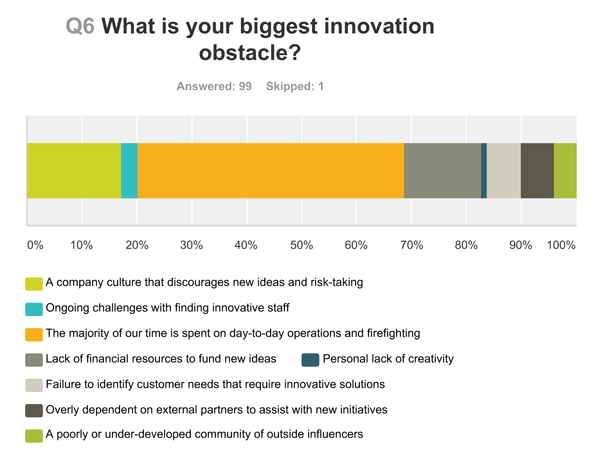 On average, respondents said innovation was “very critical” to their company’s success. Their biggest obstacle is how they design their workday–CMOs told us that their number one obstacle to innovation was the excessive time spent on day-to-day operations and firefighting. If you cannot make it to our conference, contact me anyway. We will be publishing video clips from the event for a nominal fee. CMO.com is our exclusive media partner at the conference and will report on the highlights. If you are a current client, you will receive video highlights automatically. 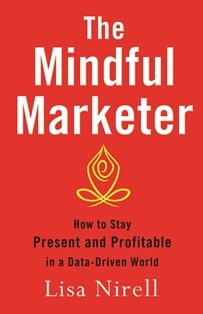 If you are a senior marketing leader who would like to learn how things have shifted since 2014, I invite you to download our 2014 CMO Trends Report. If you are not already a subscriber, we will add you to our private CMO newsletter list. If you register and see a confirmation email shortly, please click on the link to secure your subscription. This is the most efficient way to send you updates to the study and invite you to our future exclusive CMO events. Stay tuned, and you will hear more from us very soon. copyright 2015, Lisa Nirell. All rights reserved.